Dr Ruth Johnson is City Archaeologist for Dublin city and is charged with protecting, managing and investigating our oldest heritage, much of it underground. As well as conservation projects, Ruth has input to new development projects across the city and a role in policy development advocacy. We sat down for a chat to find out how she works and what’s going on across the city, under the ground, in our oldest graveyards, our buried monasteries and in half-hidden, forgotten houses. How did you first become an archaeologist Ruth? I worked on a community excavation project in Yorkshire while doing my A-levels after which I did a Primary Degree in archaeology at the Institute of Archaeology University College London, before coming over to Dublin to work in the field. I then did my doctoral research study in Medieval History at Trinity College with the support of a British Academy scholarship. After I finished my PhD back in 1997, I taught part-time in NUI Maynooth and at the same time worked as curator and education office at Dublinia. After that, I worked for a year as an archaeologist in the National Monuments Service (Department of the Arts, Heritage and the Gaeltacht), which was great preparation for the City Archaeologist role. Ruth, you became city archaeologist for Dublin City Council in 2001, sixteen years ago. During those years has there been many discoveries. Which of these were some of the stand-out digs and excavations? Well, we have uncovered several Viking burials over the last 16 years, especially around the South Great Georges St. – Ship St – Golden Lane area. Many of them are grouped around the outside of what was once the “Black Pool” / the Dubh Linn (roughly in the modern location of the circular lawn in Dublin Castle). These discoveries are significant because they help us update our Viking knowledge. A lot of the discoveries of Viking burials before this go right back to the early to mid 19th century to antiquarians like William Wilde. So our more recent excavations help improve our understanding, use modern excavation techniques and scientific analysis of the teeth and DNA, dating etc. It’s also interesting that there was a very ancient church around Golden Lane – St Michael le Pole, which predated the Vikings. What we learned from excavations is that the church continued a tradition of Christian burial right through the Viking period immediately adjacent to the Viking settlement at Dublin. There must have been peaceful co-existence between Christian Irish and pagan Viking to allow this. Not only that but after the initial settlement, Vikings may have been buried in the graveyard of St Michael’s according to Christian tradition, and they cannot be identified archaeologically. Everybody mingled together, it seems! Arch of Dublin, image of part of the old City Wall. 900-1200 years later, how can one tell who was a Viking? What are the giveaways for Viking burials? Well, the lack of an east-west orientation for example, which is the Christian tradition of burial. Also Viking-style grave goods. Men, if they were warriors are often found with sword, spear, dagger, and a shield. These days only the circular “boss” of the shield will have survived, and the head of the spear, not the shaft. For Viking women, one tell-tale sign is a type of brooch we call an oval or tortoise brooch. It was actually a sort of paired dress-fastener from Scandinavian Viking homelands. The Blackpitts area has also yielded some treasures I believe? Yes, a huge tannery from the 18th and early 19th century was uncovered by Claire Walsh at Mill Street with a really big complex of tanning pits, still intact beside a mill pond. That was remarkable to see and to preserve on record. What about old houses? Is it true some very old houses have been discovered? Yes, we are collaborating with other agencies to help record, date and preserve several very old houses from the Early Modern period (1500-1600s), which have just come to light recently, as they were hidden, often behind later facades. 9/9A Aungier Street is a good example. And there are a couple of early houses on Thomas Street too. It is a new area for us as it combines archaeology, architecture, conservation and engineering. But it’s exciting. We use the process of dendro-chronology using analysis of the growth rings of trees to find the felling date for the wood. 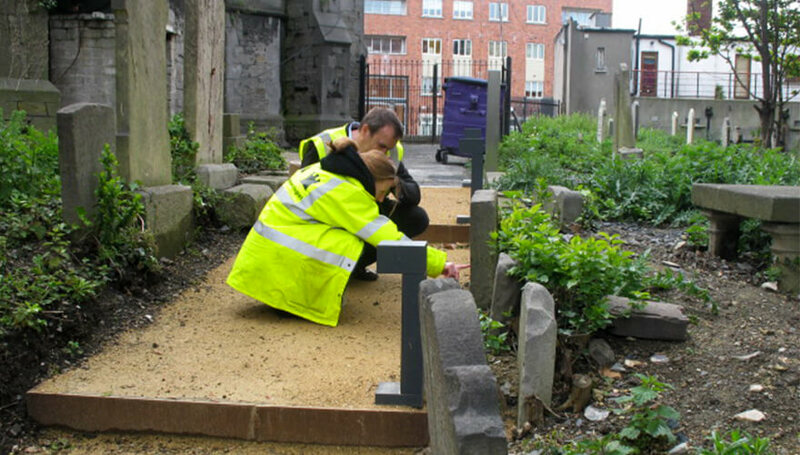 Inspecting the headstones at St James’ graveyard. A lot of the current interest is coming from the Thomas St/James’ St area? Yes, a lot is happening in that area, it’s vibrant and has a relatively settled community for city centre Dublin with a very strong connection to and pride in the history of the place. Archaeologically it has a huge amount to offer. Excavations for the Quality Bus Corridor revealed that the archaeology survives at a very high level just beneath the street along this route, which was one of the ancient Slighe of Ireland. The reason for this survival is that the Georgians (those vandals!) didn’t develop along that corridor. 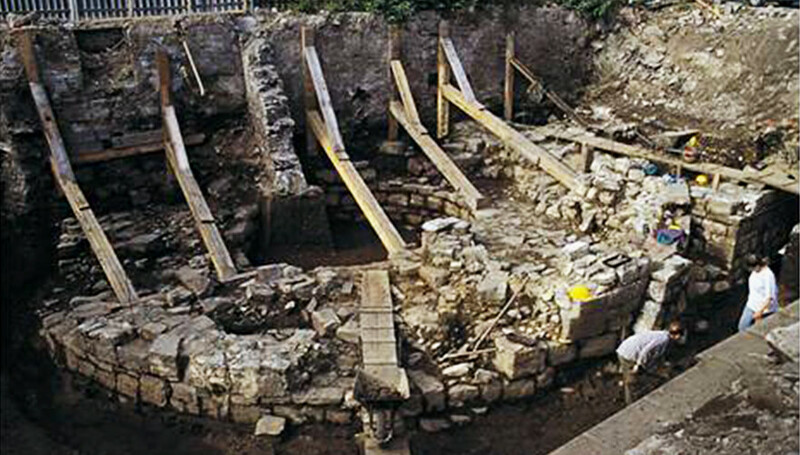 Elsewhere in the Georgian core of the city, the cellars removed the later medieval archaeology. Behind the new Pearse Lyons-owned distillery and whiskey museum in the old St James church is a hidden gem – a huge graveyard dating back 800 years to its foundation in the late 12th century. Dublin City Council has taken this site into its ownership and I have been working closely with the Parks Department and Area Office and the owner of the former Church to carry out research and develop a conservation and management strategy for the site. 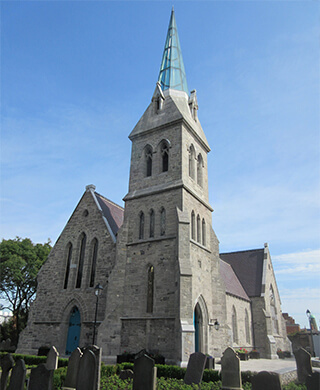 The parish church of St James was founded in the 1190s, and a huge number of citizens of Dublin were buried here, including paupers from the South Dublin Union. A conservative estimate is between 30,000-50,000 individuals interred here. Some of the gravestones are remarkable – some that are visible now go back to the 1600s, a couple even have skulls and crossbones on them! In fact, there is every type of grave there, from Commonwealth War graves to victims of 1916. Overall it’s a very significant site. It may be possible to have the old graveyard open to visitors in future, but at present, it is by request only, due to health and safety considerations. 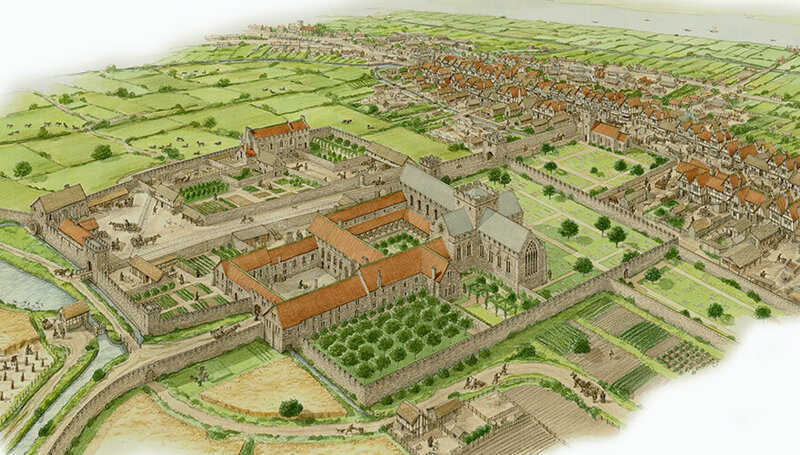 St Thomas’s Abbey, reconstruction by artist Stephen Conlin. And the most exciting of all must be the research surrounding the old Abbey of St Thomas the Martyr? Yes, a lot of interest there – we’d identified a knowledge gap back when I worked in Dublinia, at which time the floor of the Abbey church had been discovered during investigations at Meath Market. The tiled floor from the Abbey church is preserved under an allotment on South Earl Street leaving us the possibility of carrying out future archaeological investigation and presentation. The church, of course, would have been the heart of the whole monastic complex. The Abbey was hugely important throughout the Middle Ages; it was the only royal abbey founded in medieval Ireland and even had lodgings for the King to stay. It owned over 2,300 acres of land in Dublin and controlled four mills and eight orchards. It had great power, controlling two-thirds of the water that flowed into Dublin, received tithes from the City and had its own Liberty, an area of legal jurisdiction, with its own court wielding powers of trial and execution. The Abbey complex had cloisters, a church, kitchens, dormitory accommodation, as well as offices or scriptorium, a chapter house and of course, a church. We think it looked most like the Abbey at Newtown Trim, or that at Kells, Co. Kilkenny. The precinct was all surrounded by high walls. Physically most of the old Abbey is now gone of course, gone above ground at least. But there is still old fabric below the surface. Recent excavations by Paul Duffy located the northern precinct wall, on the former Frawley’s site and showed that burials associated with the parish church (founded by the abbey) ran under St. Catherine’s Lane. This new information proves that the entrance to the precinct wasn’t to the east of the church and must have been at Thomas Court. In general, there is a lot of work going on around the Liberty of St Thomas. I have to mention the area manager, Bruce Philips, who has been central to all the work in relation to St. Thomas’ Abbey. If you are interested in the archaeology of Dublin check out the excavations GIS data set that we developed, which is hosted on the heritage map viewer heritagemaps.ie. It contains all the National Museum’s topographical files (old stray finds) from Dublin and pdfs of archaeological reports from excavations in Dublin to 2012. Later excavations are on excavations.ie. Many primary excavation archives are available for researchers at the Dublin City Archaeological Archive in Pearse Street Library. On one count at least, the GPO is a disappointment to its visitors. ‘People come in looking for a big green post box. it’s a bit of let-down when I tell them there isn’t one’, says security guard David, who’s from Peckham but has Irish roots. In place of the single green box you might have expected, there are two magnificent brass-and-mahogany receptacles for your letters, one labelled ‘Dublin only’, the other ‘All other places’. Careful observation of the postman who collects the letters from these would suggest, however, that whether you put your letter in the one or the other, it’ll end up in the same bag: not everything is quite as it seems at the General Post Office.